The Inter-Agency Standing Committee (IASC) issued these guidelines to enable humanitarian actors to plan, establish and coordinate a set of minimum multi-sectoral responses to protect and improve people’s mental health and psychosocial well-being in the midst of an emergency. Humanitarian actors are increasingly active to protect and improve people’s mental health and psychosocial well-being during and after emergencies. a significant gap, however, has been the absence of a multi-sectoral, inter-agency framework that enables effective coordination, identifies useful practices, flags potentially harmful practices and clarifies how different approaches to mental health and psychosocial support complement one another. 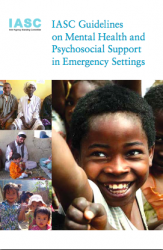 The Guidelines offer essential advice on how to facilitate an integrated approach to address the most urgent mental health and psychosocial issues in emergency situations.